The "Catalan School" of violin was related to the "Franco-Belgian School" of violin which was centered at the Conservatory in Brussels. Though greatly influenced by the music of Viotti and the French School, the Brussels Conservatory nevertheless forged its own identity. The classical and even baroque elements that had never disappeared in the French School tended to become replaced by sheer romantic elan. 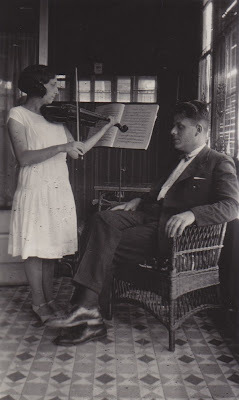 The violinists who were associated with the Franco-Belgian School include Beriot, Sauret, Vieuxtemps, Leonard, Ysaye, Thomson, Schradieck, Spiering, Marsick, Persinger, Enesco, and Flesh.". Auer is remembered as one of the most important pedagogues of the violin, and was one of the most sought-after teachers for gifted pupils. Many famous virtuoso violinists were among his pupils, including Mischa Elman, Konstanty Gorski, Jascha Heifetz, Nathan Milstein, Efrem Zimbalist, Georges Boulanger, Benno Rabinof, Kathleen Parlow, Oscar Shumsky, Paul Stassevitch, and Sasha Lasserson. Auer also taught the young Clara Rockmore, who later became one of the world's foremost exponents of the theremin. In lieu of weekly lessons, students were required to bring a complete movement of a major work. This usually demanded more than a week to prepare. Once a student felt ready to play this work, he had to inscribe his name 10 days prior to the class meeting. The student was expected to have his instrument concert ready and to be dressed accordingly. An accompanist was provided. An audience watched—comprised not only of students and parents, but also often of distinguished guests and prominent musicians. Auer arrived for the lesson punctually; everything was supposed to be in place by the time he arrived. During the lesson, Auer would walk around the room, observing, correcting, exhorting, scolding, shaping the interpretation. "We did not dare cross the threshold of the classroom with a half-ready performance," one student remembered. While Auer pushed his students to their limits, he also remained devoted to them. He remained solicitous of their material needs. He helped them obtain scholarships, patrons and better instruments. He used his influence in high government offices to obtain residence permits for his Jewish students. He shaped his students' personalities. He gave them style, taste, musical breeding. He also broadened their horizons. He made them read books, guided their behavior and career choices and polish their social graces. He also insisted that his students learn a foreign language if an international career was expected.